Blue Plum Preserves is coming up in a few weeks. That’s Blue Plum, Tennessee’s, annual historical festival—a weekend of old-time craft demonstrations, fiddle music, storytelling, and chicken dinners. 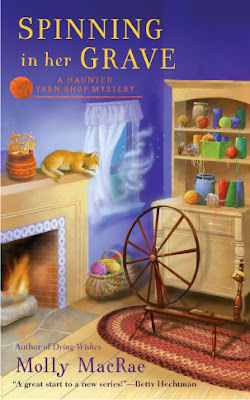 The Weaver’s Cat and TGIF (Thank Goodness It’s Fiber) will have a tent where we teach children to use drop spindles and let adults try their hands at various types of spinning wheels. I love this kind of celebration, and although this will be the tenth Blue Plum Preserves, it’ll be my first and I’ve been looking forward to it. 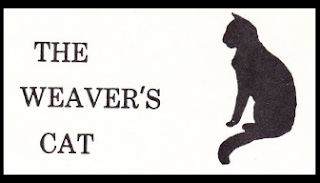 But then a man walked into the Weaver’s Cat and told me about his plans to re-enact the Blue Plum Piglet War. “Your town board already gave us permission—” Mr. Prescott started to say. I don't know about this. I sure hope things don't spin out of control. 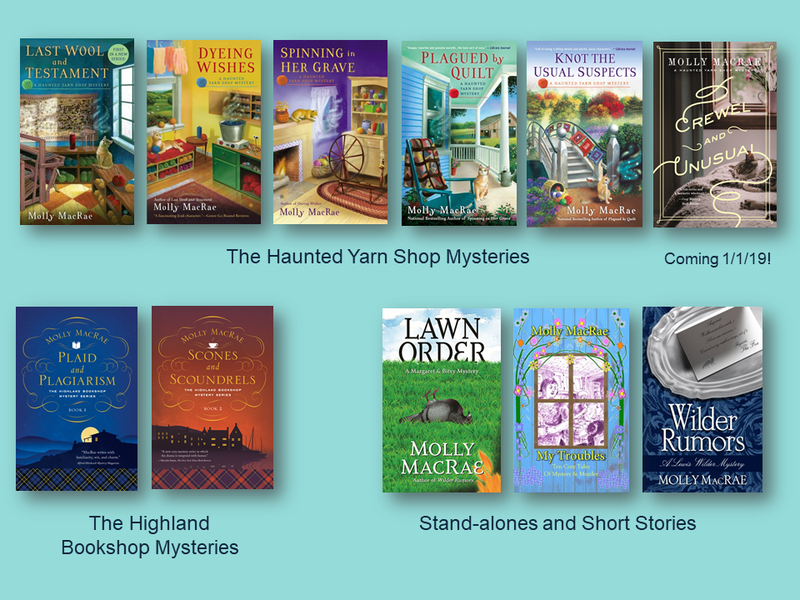 Counting up from 1 to 6 – 5 months of giveaways celebrating the release of Crewel and Unusual, book 6 in the Haunted Yarn Shop Mysteries, on January 1, 2019. Leave a comment and your email address by midnight October 25th for a chance to win a copy of Spinning in Her Grave. Do you already own a copy? That’s okay! Win another and give it to a friend. Molly MacRae is the author of the award-winning, national bestselling Haunted Yarn Shop Mysteries and the Highland Bookshop Mysteries. Visit Molly on Facebook and Pinterest, connect with her on Twitter @mysteryMacRae. Guns and piglets??? Are they barking mad??? Blue Plum Preserves sounds like a great little town. Being one that lives in a town of less than 3000 people but has some sort of festival about every month of the tourist season (April-October) including the BeanFest with outhouse races this coming weekend. I can imagine all the fun and excitement. I would love reading about it! Thank your for the fabulous chance to win a copy of "Spinning in Her Grave"! Love the cover with it's cute kitty and ghostly like swirl by the window to the contrast between the warm fireplace to the open window and the neat yarn in the basket to the yarn quite evidently played with by that kitty. This book is on my TBR list too. Love this series. Have the books already but would love to share. duduerst at tds dot net. Guns? Men running around town and into stores with them? I haven’t read this yet. Thanks for the chance to win a copy. The premise sounds wonderful...love mysteries. Sounds like quite the festival! Would really like to read more about the Weaver's Cat and Blue Plum TN. "Spinning in Her Grave" sounds like a great read. Somehow I missed this book in the series and would love to win - Thank you so much for the opportunity! I agree with Kath - running through the street with guns for the re-enactment of the Blue Plum Piglet War sounds like a bad idea. I love this series! I can't wait for the new book! I'm thinking things will spin out of control. I don't have a copy. The series sounds amazing. Oh my! I missed this one. I’m actually reading the next one. Yikes! I hate when that happens! This one sounds like a good one. Thanks for this intricately woven series! Lldawnjm (at) gmail (dot) com! Sounds intriguing. I haven't read this yet. Thanks for the chance. That's a mighty cute piglet! Please enter me. I have not read this series and love to find new cozies. Blue Plum, Tennessee sounds like a charming, and perhaps quirky, little town. This is a series I had not run across yet, and sounds like I would like it. I'm also heading over to your page to learn about the highland mysteries, as I have always been intrigued by that part of the world. This was the funniest book!!! I love the whole series! I LOVE these books! Geneva is my favourite (I wish I could have a ghost like her!). I only buy books that I have read and want to revisit again and this series are it! Love love love!